The project involved overlaying leading two-person home delivery expert Arrow XL’s existing concrete trailer yard in Wigan with a flexible surface course, creating a secure car park for both staff and visitors. Invited to tender for the business were several contractors, including civil engineering firm, James Callaghan Sons & Co Ltd (Calco). Aggregate Industries’ specialist asphalt division was able to offer its expertise to Calco to help identify a solution that would satisfy the client’s budget for the completed works, whilst also delivering a quality finish and avoiding any delamination between the concrete and the newly laid surfacing. 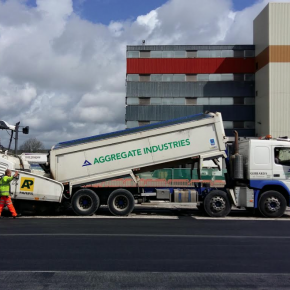 After reviewing the project requirements in detail, the asphalt team concluded that Aggregate Industries’ SuperFlex, a highly durable surface course, would be the best option to reduce the risk of reflective cracking and provide the high levels of durability required for a busy car park. Calco refined the proposal of works to also include the use of a spray jet paving machine which would achieve a better bond via a continuous application of a hot, bituminous tack coat as the SuperFlex was laid in a single layer straight onto the Concrete. Despite this fully tailored approach resulting in additional costs being forecast, the quality and reliability of the finished surface was crucial for the client. Works commenced in February 2018, with Aggregate Industries delivering 770 tonnes of SuperFlex AC10 surface course to site on schedule, with all particular logistical requests by Calco happily accommodated. The project was completed in two phases and handed over in April 2018. Charlotte O’Connell, Territory Sales Manager at Aggregate Industries, comments: “SuperFlex is an ideal material when overlaying concrete due to its enhanced elastic properties provided by the poly-modified binder. SuperFlex also gives great results in the highway sector across the country, and is a product we are incredibly proud of.